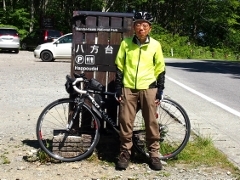 Today, I visited Goreibitsu Pass (876m) and nearby Mount Taisho-hatayama (1056m) in the western part of Koriyama. It’s already the end of spring and I enjoyed some of the late spring mountain flowers. 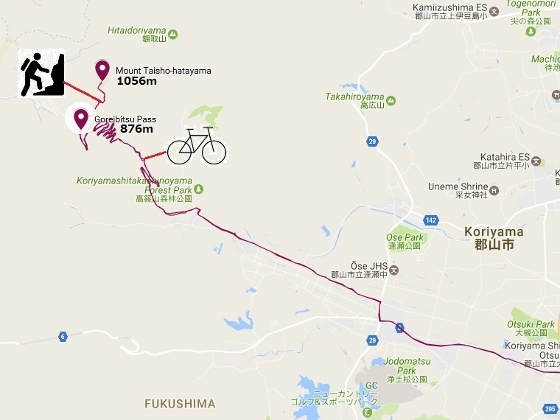 Goreibitsu Pass was 25km apart from the central part of Koriyama and I went there pedaling my bike. Mount Taisho-hatayama was about 1.5hr hike from there. 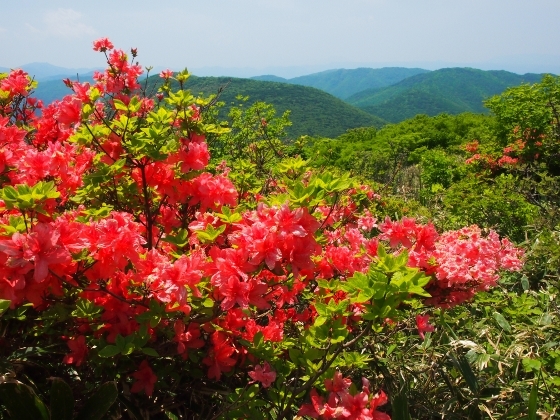 Photo above shows Goreibitsu Pass trail toward the mountain where wild azalea flowers were in their last bloom. Some of the flowers I met today are shown below. 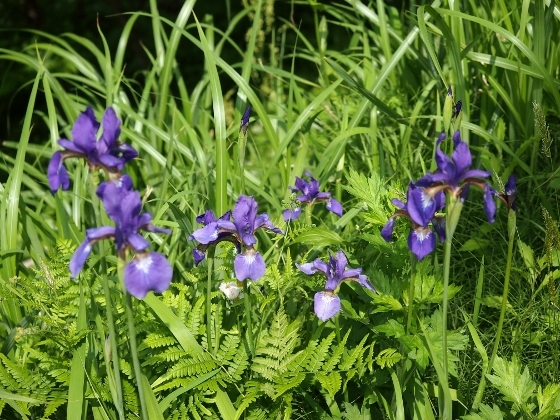 On the way to Goreibitsu Pass, I found some wild iris flowers on the roadside as shown above. 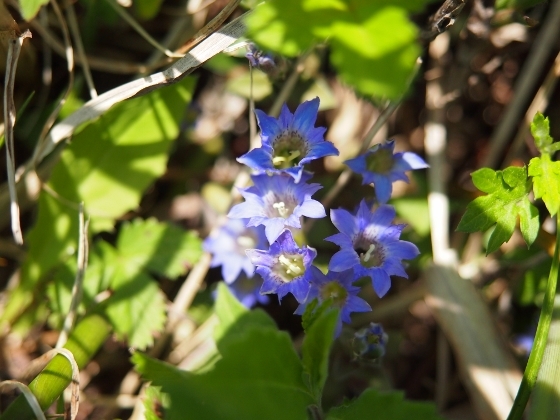 There was a wild flower garden along the trail path just before reaching Mount Taisho-hatayama. Some flowers I found there are shown below. Tiny flowers of gentian family called Harurindo or Gentiana thunbergii which bloom in spring are shown above. 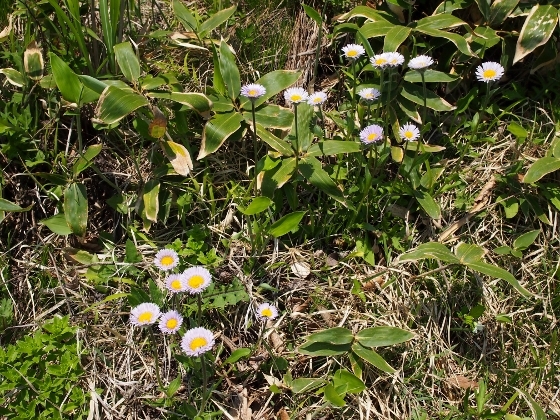 The area was a habitat of Azumagiku or Erigeron thnbergii which was a kind of wild chrysanthemum as shown above. 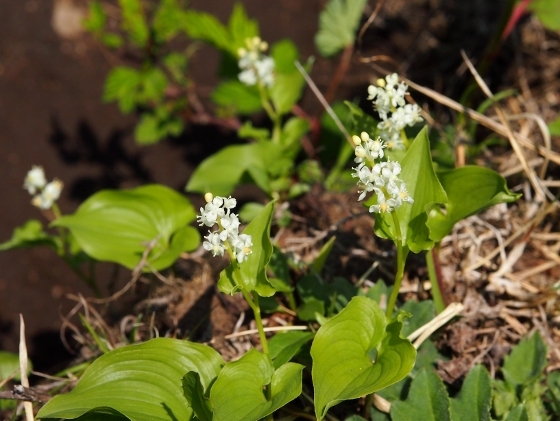 Alpine flowers of Maizuruso or Maianthemum dilatatum were also seen as shown above. 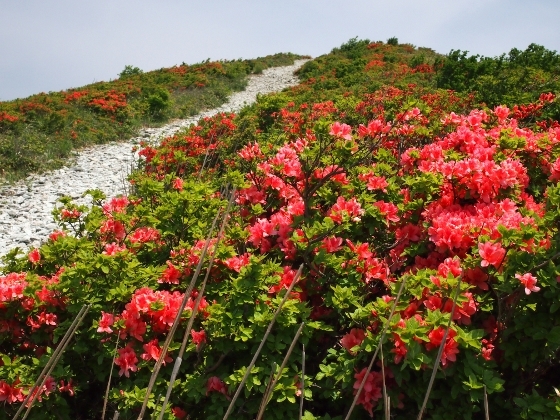 Of course, late bloom of wild azalea was also found as above. 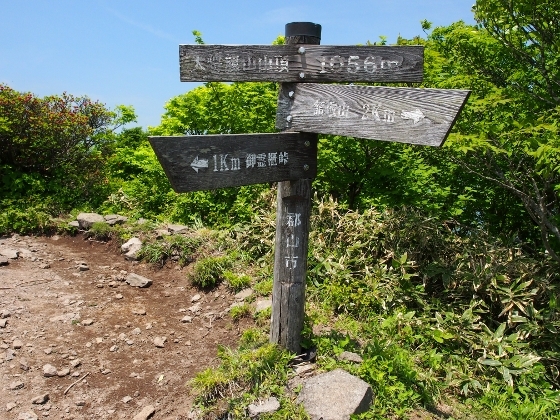 Photo above was the summit of Mount Taisho-hatayama which was the goal today. Today was a fine day with clear blue sky and I visited Mount Takashiba (884m) in Ono Town. 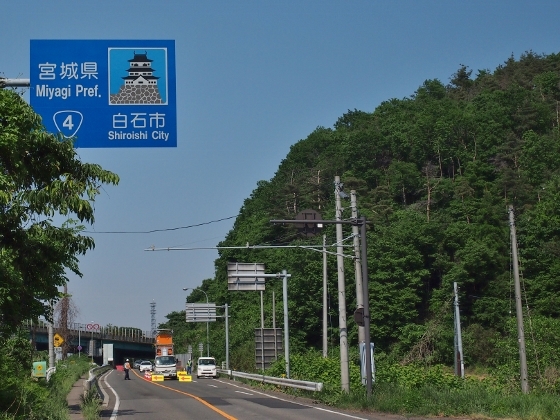 It took about 23km bike ride from my home in Koriyama to Ukigane trail entrance point. The summit of the mountain was about 30-minute easy hike from the point. 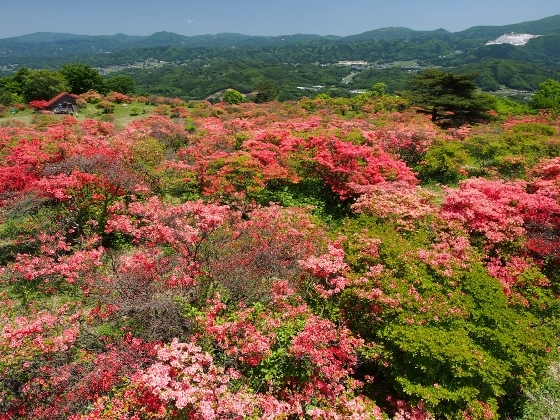 The view from the observatory on top was panoramic as shown above with wild azaleas in full bloom on the mountainside. A board shown above describes how this wild azalea garden was made. More than 90 years ago, a large pasture area for farm horses was created on top of this mountain. 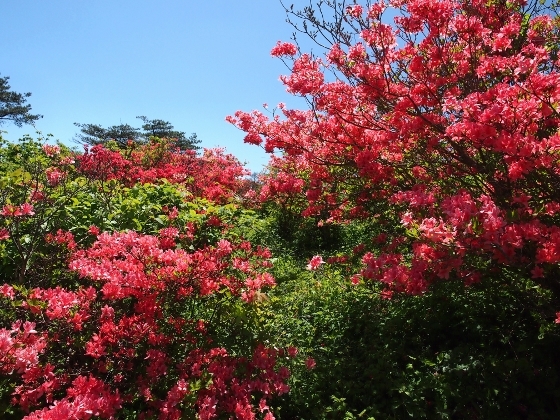 Large trees were cut down and grass was eaten by horses, but azaleas were not eaten much because they were a little poisonous. 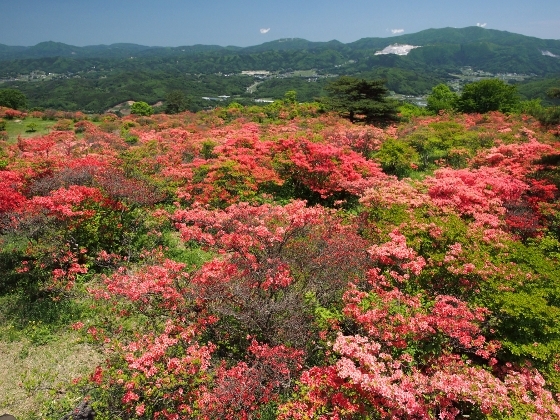 After the World War Ⅱ, the pasture ended and local people have taken care of the wild azalea garden for preservation. Another view from the top observatory with a little bit different angle is shown above. A view while climbing is also shown above. Some of the flowers of wild azaleas were starting to fall off onto the ground today. The peak season has just passed. 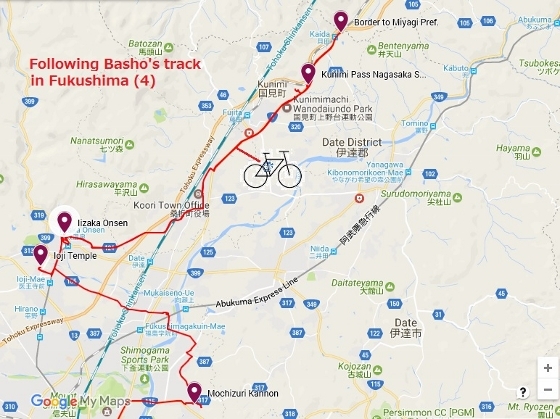 Basho left Kitamachi, the central part of current Fukushima City, and continued his journey. 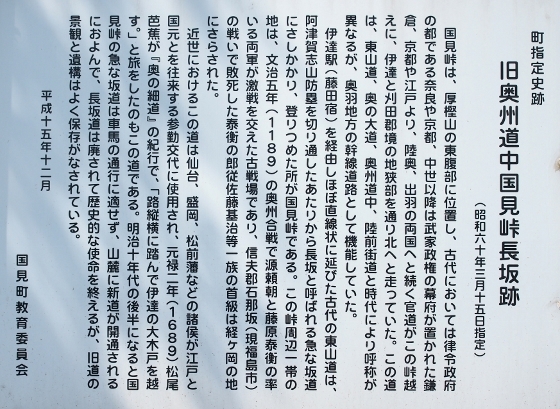 Photo above was an old Oshu Highway Site remained as it was in Kunimi Town. 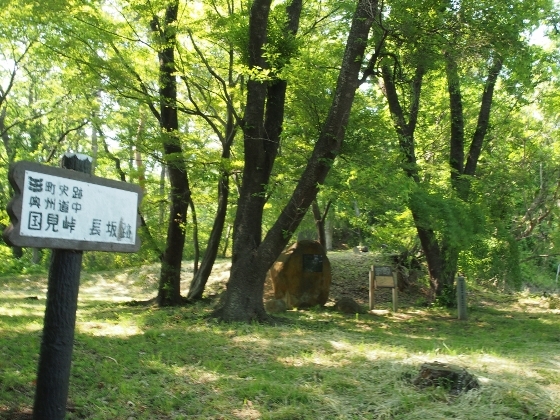 The site is located about 200m apart from the current National Route 4 and is called Nagasaka Site of an old Kunimi Pass. 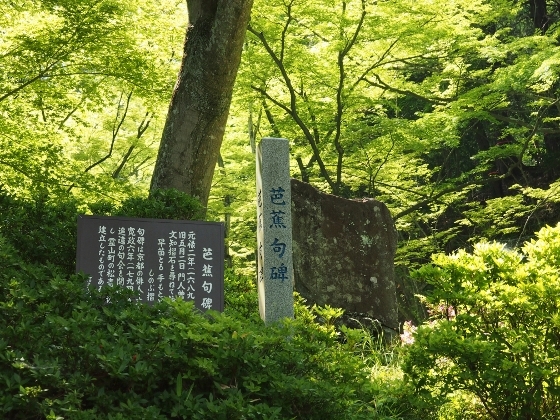 Basho traveled through this route and his memorial monument stood there. The first destination of Basho after leaving Kitamachi was Mochizuri Kannon in the east of Fukushima City. 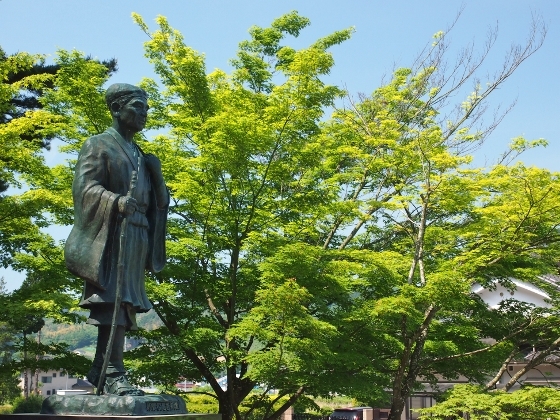 As I visited there today, I found Basho’s statue in front and his monument of Haiku poem in the central precinct as shown above. The old historic temple dates back more than 700 years. 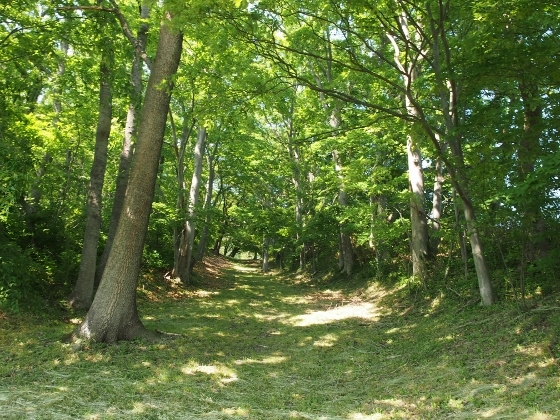 Since then many historic buildings and monuments had been built at the site. A board above tells us the history. 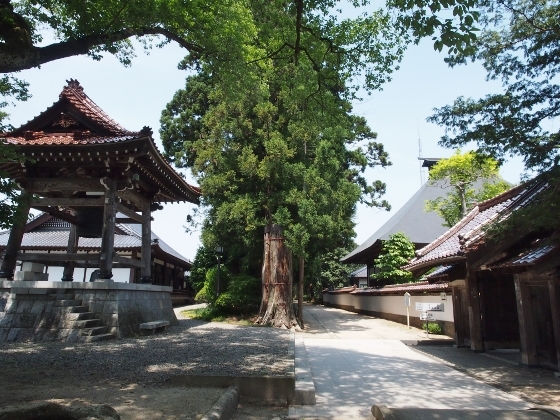 Then he visited Ioji Temple in the west which was located in the current Iizaka Onsen district. 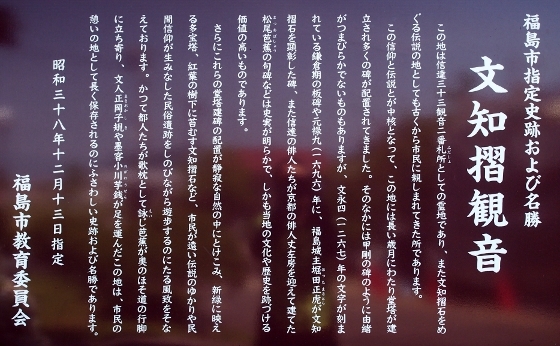 The temple started in 826 as described in a board above. The precinct was large as shown in the picture above. Basho then visited hot spring site of Iizaka Onsen. I went to the site he was said to have visited, where a panel shown above stood. 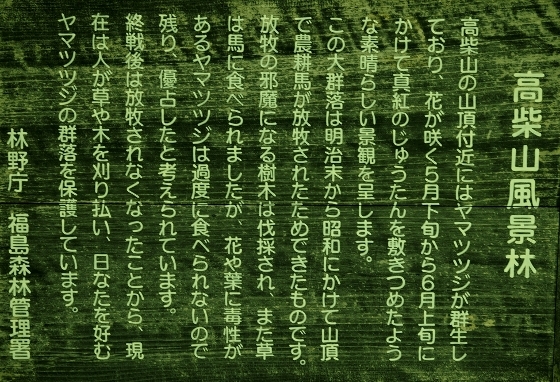 It said that this site called Takinoyu Site had long been considered Basho’s bathing and staying place at Iizaka Onsen. 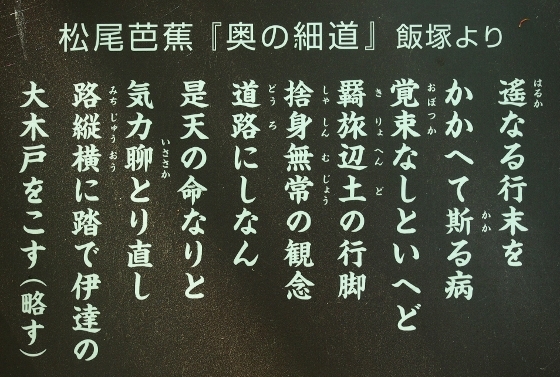 But the recent research showed that he might have been to other places such as Sabakoyu or Tozayu, both of which were within this hot spring resort. Finally, he headed toward Miyagi Prefecture in the north. 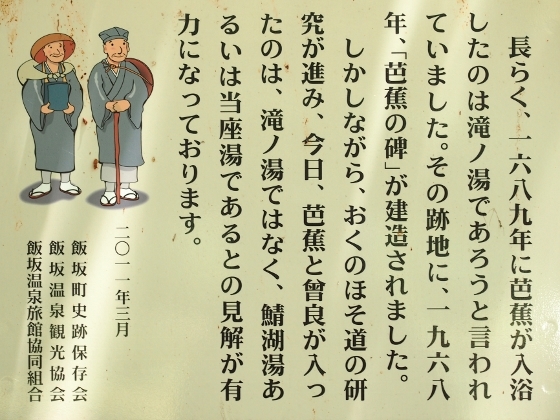 There was a historic site in Kunimi Town where he traveled on the way as I introduced at the beginning. 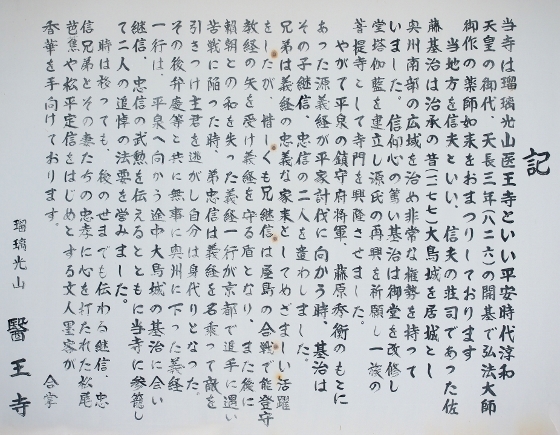 At Nagasaka Site of an old Kunimi Pass not so far from border with Miyagi Pref., there was a board as shown above which described his hard journey in his own words from “Okuno-hosomichi”. 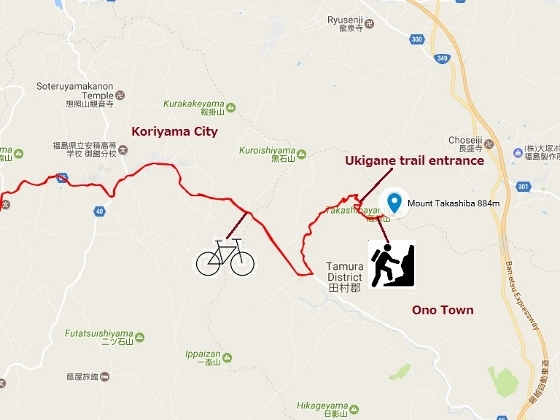 He said that he struggled through Kunimi Pass getting some illness and recognizing his long way ahead north. But he managed to pass the route with his innocent and vital spirit. The picture above shows the current border between Fukushima and Miyagi, where I ended this journey which followed Basho’s tracks in Fukushima.